Back in the classroom and throughout early development years, we have all come to rely on financial formulas to accurately predict investment returns. Coefficients were often applied. Coefficients assigned to variables like Alpha, Beta, Information, Correlation and Variation. Yes, these investment ratios have withstood the test time, but as the consuming marketplace shifts toward the Millennial generation, is there, perhaps, another coefficient that developers should get to know? The answer, quite simply, is "yes." 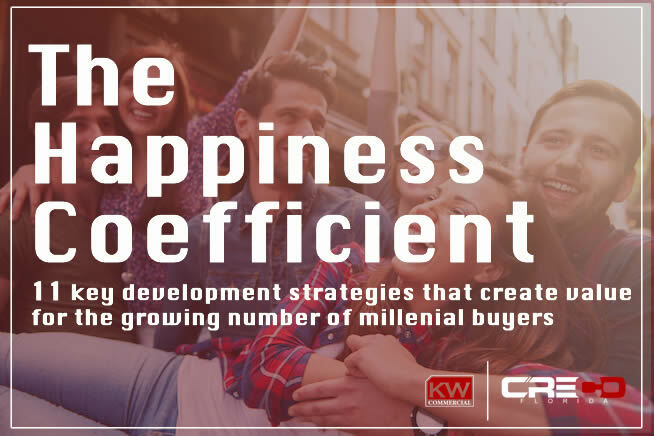 While it may initially appear to represent a non-monetary ratio, the all important "happiness coefficient" is quickly becoming a standard metric among large-scale developers and investors. As developers rely more and more on sustainable attributes to lure potential buyers to any new project, today’s designers hone a practical, results-driven approach to sustainability. This “all in” mentality has yielded continued successes throughout all facets of the mixed-use community and has provided all developers, builders, engineers, planners, and occupants of sustainable new urban centers with a robust framework that will guide future sustainable endeavors throughout the United States. Millennials will drive the future of development and all associated allocation of investment capital to new communities across the nation. Savvy investors understand this demand of a sustainability-oriented approach. As such, a commitment to sustainability is present from the inception of almost every new large-scale development project planned in nearly every region of the country. Here are the TOP 11 Happiness Indicators that New Developers Need to Remember When Contemplating Sustainability Status. Developers should designate sustainable tasked agents throughout the development process and in all areas of the community. This dedication to sharing information across all parties involved in the community will help to achieve maximum sustainability at every level and every opportunity. Any sustainable objective must incorporate a comprehensive mixed-use master planned community to provide a clear, natural, and lasting lifestyle for all occupants, patrons, and residents. Instinctively, patrons and consumers adhere to the natural conservation goals of any region and any surrounding communities. This natural instinct and desire to connect with open space lead new communities to demonstrate a robust system of parks and green space. Open space initiatives significantly contributed to the residential, commercial, and infrastructure building to provide a natural and enhanced collective community within any new sustainable community, even if the community does not officially market a "sustainable" consumer base. Innovative strategies should be implemented throughout any new development to avoid light pollution and energy waste. Developers and lighting engineers accomplish this task while providing communities with a lighting strategy necessary to add safety, aesthetic, and functional lighting systems throughout all components of the community. Perhaps a natural light profile won’t be the first aspect that new buyers notice, but over time, patrons and users of a community will come to greatly appreciate (and place value on) a well-executed lighting plan. As a critical component of a new community’s ultimate success, planners and developers must commit to establishing a sustainable baseline for all new single family and multi-family residences. The recognized objective was to provide an expectation of quality, stability, health, comfort, and efficiency that may be valued as the standard for all new residents interested in purchasing any portion of a new development. Profits drive commercial developers, but that does not abate an overall commitment to energy efficiency, innovative material selection, a pledge to responsible water management, and acknowledgment that indoor air quality significantly impacts the occupants of any commercial building. Soon, commercial developers realized that profits did not need to be sacrificed to meet pre-determined sustainable goals and community-wide initiatives. Developers understand that success is primarily based on a commitment to utilize recycled and salvaged materials from the land redevelopment site. New market segments demand that developers address the recycling of cleared trees, water mitigation strategies, animal relocation initiatives, etc. Developers understand that a reduction in overall vehicular traffic volume greatly enhance the community experience and lead to a more sustainable development. Successful planners often rely on this notion to encourage the use of alternative transportation methods for all occupants of new developments. Regardless of region or climate, any successfully sustainable development must embrace the notion that all occupants, residents, and patrons understand the importance of effective water management and conservation. Today’s developers preemptively establish a water management master plan that integrates proven strategies, community oriented conservation efforts, intelligent landscape design, integrated water reclamation, and outreach to educate the community on the importance of water conservation. 11) Healthy Living and Well Being for Residents. Ultimately, a community derives success from the satisfaction of its residents and occupants. Therefore, new developers set out to establish energetic and lively master community environments to promote and support healthy living within all areas of the community concept. The Millennial Generation places a subconscious value on sustainability. While classic builders measure profit in a standard monetary aspect, future developers measure success using a different scale. Sustainability, resident satisfaction, environmental impact, and general goodwill are valued today more than ever. Think about adding a "happiness" coefficient to your proformas and financial forecasts and you just may be onto something that future generations will value. Brad Kuskin is the Managing Agent for Keller Williams Commercial Real Estate in Southern Florida. Serving as the premiere broker for commercial real estate in South Florida, KW Commercial leverages the nation’s largest real estate network to serve all commercial real estate needs. Contact us today with any questions, market insight, or investment property needs.